Terrorists of the so-called Islamic State (ISIS/ISIL) have destroyed part of the Roman Theater and the ancient four-column structure Tetrapylon, in the historic city of Tadmor (Palmyra), the Syrian Antiquities chief said. The façade of the Roman theater has been completely destroyed, according to Maamoun Abdulkarim, the Syrian Director-General for Antiquities and Museums. Referring to recent satellite images of the site. Tadmor had been liberated from the terrorists, early last year, by the Syrian Arab Army – which had evacuated civilians, and many portable ancient Syrian treasures, in May 2015. However the US-led coalition and its allies of the GCC and Turkey will not miss a chance to weaken Syria, divide us, and erase our identity, first by genociding us, as inhabitants of our own country, second by pushing us to leave our homeland, running away from the horror of the foreign-imposed war, poverty that did not exist before 2011, and draconian sanctions against us. The third way is cultural genocide, the removal and erasure of our 10,000-year history, to force us to become like a land without memory, without identity. Two years ago, convoys of terrorists rushed with vehicles, equipment, terrorists from Iraq to Syria, under the eyes of the US-led coalition. The US is permitted to bomb Iraq; it is not permitted to bomb Syria. But the US watched the terrorists come through the desert to destroy our cultural heritage. What was the comment of the US spokeswoman Marie Harf, then? It was, ‘we can’t do anything but watch!’. War criminal bombers of our country could only watch their terrorist friends leave Iraq, to enter and destroy Syria. Look at these photographs of ISIS TERRORIST CONVOY PARADE, leaving Anbar, Iraq — sharing the desert with Syria, traveling the distance of 368km/228.6mi. Yet we must believe US-led coalition could do nothing? This ideology of savage destruction of beauty does not belong to the so-called ISIS, only. The original gangs of terrorists were members of the ‘Free Syrian Army,’ which began the destruction, bombing ancient mosques, churches, statues, in Aleppo, Homs, and Damascus. The ancient souqs of Aleppo were burnt to the ground by the ‘moderate FSA’ that also threw mailmen from a rooftop, stole 1,000 factories from Aleppo, kidnapped the Yellow Man celebrity, who was last seen being beaten by these moderates. Some mainstream media did report that their supported ‘rebels’ did these things, and added that some of the stolen antiquities were sold to the west. Here, I go back to ask you, even before this systemic war on Syria, why museums like the one in Germany, has possession of an ancient piece of Nefertiti, stolen from Egypt? Do you know that the German-Orient Association was given the racist, colonialist license to excavate Court Sculptor Thutmose’s workshop, in 1912? That Thutmose created the beautiful bust of the Egyptian queen in 1340 BCE? That the claim was the license was granted by the “government of Egypt,” but that this ‘government’ was ruled by the Ottoman Empire, which was dominated by the British Empire, in Egypt, and that the “Antiquities Department” had been under French colonialist authority since invader Napoleon Bonaparte’s occupation of Egypt, 100 years earlier? And that this is how the great, stolen Egyptian artifact has come to be housed in the Neues Museum in Berlin? Bust of Queen Nefertiti, sculpted with limestone and stucco, stolen by colonialist licensure. How is the west permitted to give legitimacy to calling a 3,356-year-old sculpture of an Egyptian queen a cultural symbol in a country that was named the German Confederation in 1815? Does the west have no sense of decency? What happened, also, to the Iraqi ancient antiques, opened to looting by US soldiers, and Iraqi carpetbaggers? Why is the colonialist west permitted its history of theft, looting our ancient history that predates theirs by thousands of years, and putting our culture, our history, into their adolescent museums? Western media lies about us, bombs us, steals our beloved history, changes our geography, and savagely dismisses us, civilized elders, as primitive. The term “middle east” was coined by the British Empire, as its personal geographic region of all the countries it had invaded, occupied, butchered populations, and from which it stole resources and raw materials. The UN updated the colonialist name, with the acronym MENA suggesting that this is a new continent. The reality is that the Levant is part of the continent of Asia, and countries in Africa are part of the African continent. No racist genocidalists can change these facts. People who consider themselves anti-invaders, anti-occupiers should stop using the language of destroyers. The UN has shamelessly condemned the destruction of these monuments. The UN also condemned the torture, and beheading of 82-year-old Professor Khaled al Asaad, the semi-retired Director of Antiquities, who refused to leave his beloved Tadmor during the May 2015 evacuation by our army. 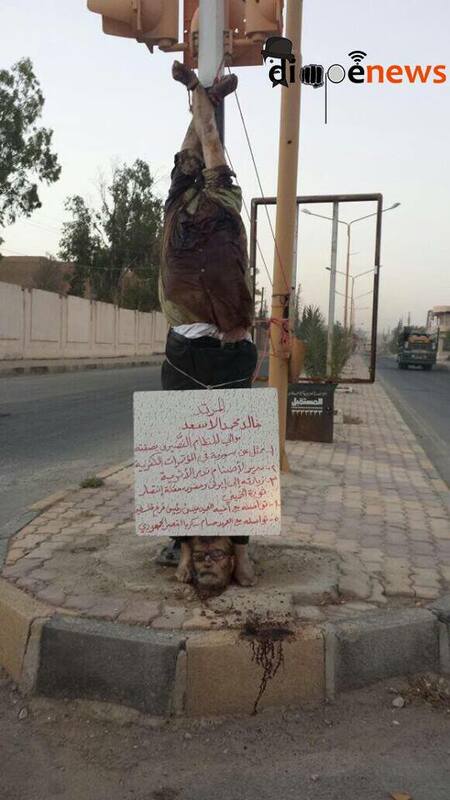 The US/EU sponsored takfiri hung Dr. al Asaad’s body upside down, and viciously placed his glasses on his severed head. GRAPHIC- 82-year-old Professor Khaled al Asa’ad decapitated body hung upside down with his head in front. The condemnation is shameless, murderous hypocrisy, as the colonialist P3 (US, UK, France – leading countries of war crimes, none of which has ever been brought to justice) running the UN have supported the criminal destruction of Syria. The US itself has reported spending more than $2 billion to arm, train, and feed the terrorists in Syria, since the beginning of the foreign-imposed war. While US “fake news” NATO MSM has obsessed over the non-existent hijacking of the US presidential election, it has had no time to report on the weapons depots discovered in the newly liberated Aleppo, filled with US/NATO artillery. There has been no report on the mass graves and human slaughterhouses. No mention of the almost 1k hectares cleared of explosives left by US/EU moderates, by Russian sappers. At this time, the neo-left, abruptly awakened from its collective coma during the war crimes of Obama, have descended upon DC, to protest against President Donald J. Trump, who has not committed a single war crime. Among the neo-left are Women’s Groups. Will any hold the photograph of this sister, a Syrian woman whose child was kidnapped, whose husband was murdered, who was tortured and burnt? Will anyone hold her photo and ask the new president to stop funding and arming the terrorists who destroyed her life, and part of her country?